The Dolomites have inspired and intrigued travelers for centuries, or possibly for millennia, as they are believed to be more than 200,000 years old. August 2018, additional exposures for highlights, focal length 17 mm, aperture f/11, shutter speed 0.4 seconds, ISO 64, tripod. They are lovely and quite unexpected, as they don’t look like what you imagine the Alps to be. Most people picture snow-capped peaks and vast seas of evergreen when they think of the Alps, but the Dolomites are different. When touched by early morning light or sunset, they seem to glow with a deep rose hue. At such moments they seem out of place, like formations that belong in the Badlands of the American West. I could hike the many trails through the Dolomites endlessly, enchanted all over again with each new view. But I knew I wanted to photograph the famous Tre Cime de Lavaredo, three peaks that are one of the most famous parts of the range. I wanted to photograph Tre Cime at sunset, when I believed the light would be the beautiful. This required some effort. To reach the park from Cortina, it requires a drive of 40 minutes, and then a hike of another 40 minutes to reach the best viewing point. I was determined to get there in time to see the sun set over those striking formations. The park permits you to spend one night in the park in a tent if you have nowhere to go and if you leave in the morning, so I decided that we would bring a tent and make a night of it, since we would be there at nightfall, anyway. We reached the best vantage point shortly before sunset, and I began to set up my gear. As the sun began to descend toward the horizon, I realized that all the extra effort was worth it. Tre Cime was stunning in the late afternoon light, like a landscape from another world. 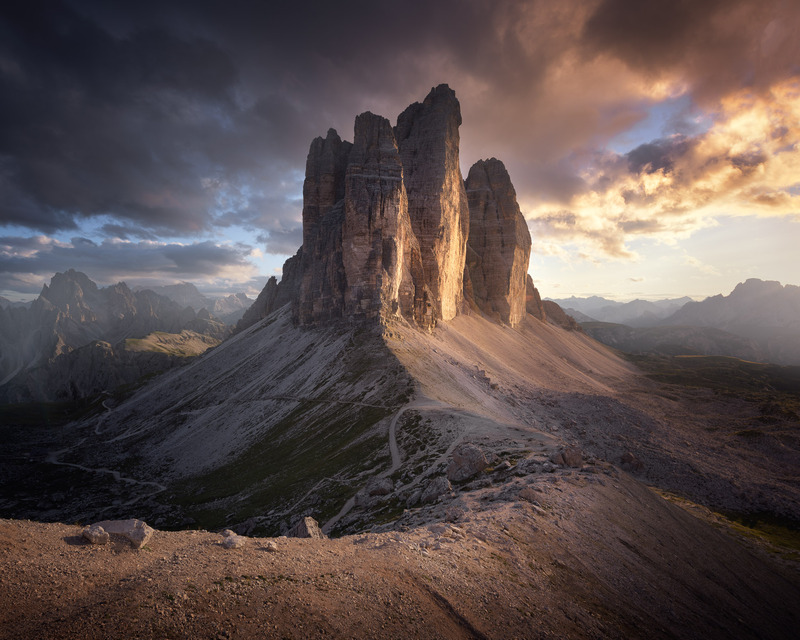 The time of day that Da Vinci referred to as “the golden hour” was a truly remarkable time to see Tre Cime. No one spoke; it was a moment that seemed to demand silence, reverence. I took my photos then sat in wonder as twilight settled over the Dolomites. This entry was posted in Landscape and tagged Dolomites, Italy.